I am not willing to pay $20 to go up the skypark. I have spent most of my working life working above the 40th floor. It doesn't make sense. 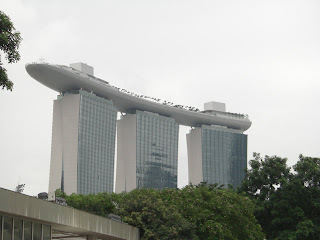 Likewise I have also not tried to go on the Singapore Flyer. If it were free, I might go but then everyone would also want to ride the elevators up. I have received numerous emails from friends overseas about this sky platform, but like those attractions in Dubai e.g., the Palm, it is not a great when you are there.